Baptists in America are sensitive to forced government actions that infringe on their religious liberty. America’s first Baptist leader, Roger Williams, fled Massachusetts and founded a colony in Providence, Rhode Island, because his religious beliefs were not allowed under Massachusetts laws. East Texas Baptist University & Houston Baptist University v. Azar. The Becket Fund for Religious Liberty (n.d.). Retrieved from https://www.becketlaw.org/case/east-texas-baptist-university-houston-baptist-university-v-price/. East Texas Baptist University & Houston Baptist University v. Azar. (Apr. 04, 2019). https://www.becketlaw.org/case/east-texas-baptist-university-houston-baptist-university-v-price/. "East Texas Baptist University & Houston Baptist University v. Azar." The Becket Fund for Religious Liberty. Accessed [Apr. 04, 2019]. https://www.becketlaw.org/case/east-texas-baptist-university-houston-baptist-university-v-price/. East Texas Baptist University and Houston Baptist University are Christian liberal arts colleges in Texas that hold faith central to their educational missions. East Texas Baptist University (ETBU) is committed to “Christian stewardship” and “academic excellence while integrating faith with learning.” Its religious beliefs include traditional Christian teachings on the sanctity of life—this includes that all human beings bear the image and likeness of God, and therefore that all human life is sacred and worth protecting. The rich Baptist tradition is manifested in the missions of these two Christ-centered Texas universities, but a government mandate threatened their beliefs. The government’s HHS mandate forced these universities to either violate their faith-driven mission by providing services such as the week after pill, or pay crippling IRS fines. 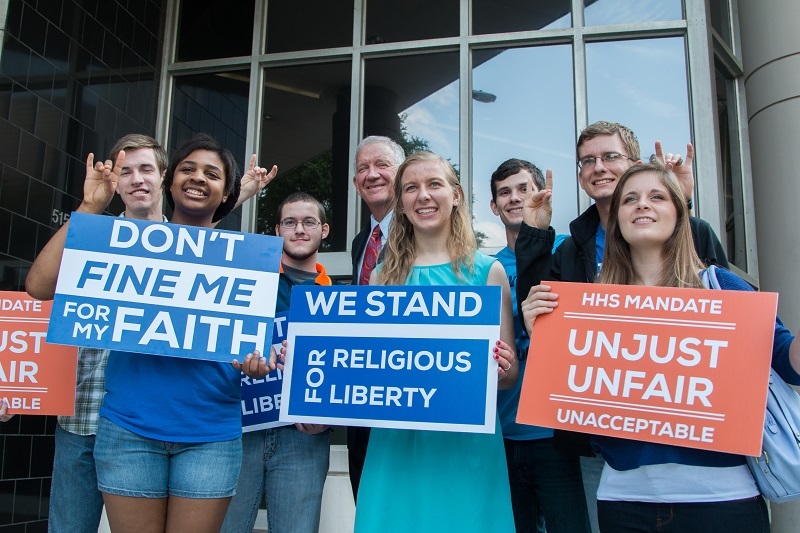 So in October 2012, East Texas Baptist University and Houston Baptist University joined Becket to fight this unconstitutional mandate, which would eventually be defeated by a unanimous Supreme Court decision. In March 2013, Westminster Theological Seminary intervened in Becket’s lawsuit on behalf of ETBU and HBU in federal district court, which ruled in favor of the religious schools in December 2013. However, the government appealed to the Fifth Circuit Court of Appeals, which reversed the district court’s decision in June 2015. In July 2015 Becket along with former Solicitor General and leading Supreme Court advocate Paul Clement, appealed to the Supreme Court on the universities’ behalf. In March 2016 the Court heard the case along with the Little Sisters of the Poor and other religious non-profits in the consolidated case called Zubik v. Burwell. On May 16, 2016, the U.S. Supreme Court unanimously protected the religious groups, stating that that the government cannot fine ETBU and HBU for carrying out their religious beliefs in their health plans and must find another way to provide services to women who want them. It also threw out the lower court decision against the universities. In May 2017, President Trump issued an Executive Order directing HHS and other federal agencies to protect the Little Sisters of the Poor and other religious ministries from the HHS mandate. Following the order, HHS Secretary Tom Price said that HHS “will be taking action in short order” to protect the Little Sisters and other religious ministries harmed by the mandate.